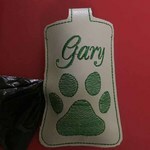 Another Doggie "Pickup" Bag.l This is for a friend's dog, Gary!! I just went back and clipped the jump stitch between the G and the a. Does anyone else see something to fix on their project, after the picture was taken?? Thanks for taking a look!